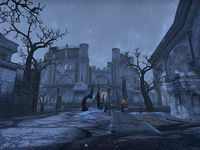 The Arena District is the eastern district of the Imperial City. Immolator Charr can be found here. The district contains a four-wave PvE arena. The entry gate, which locked during each wave, was removed in Update 10. This allows for unhindered PvP inside the arena, which was previously subject to players blocking the gate with Caltrops, preventing entry by enemy players. After the final wave, participants are rewarded with a chest. 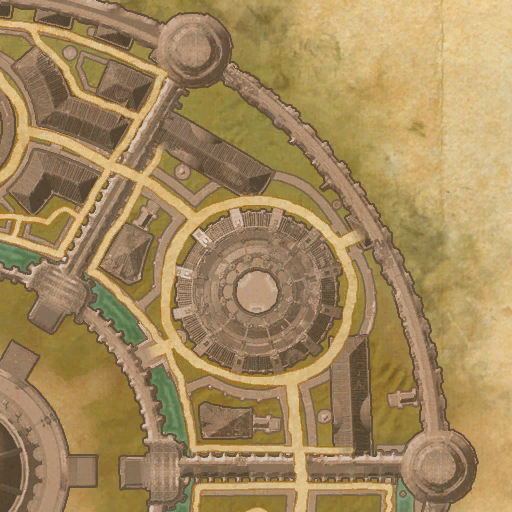 Arena District Objective: Discover Molag Bal's secret plan for Imperial City. 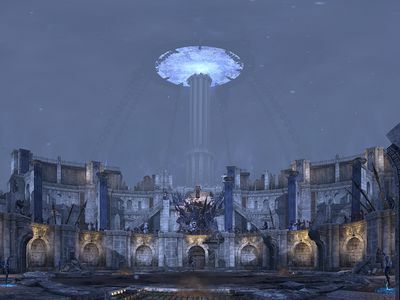 The Watcher in the Walls: Turn the tables on the Daedra in the Imperial Arena. The Lifeblood of an Empire: Rescue Imperial citizens from the Daedra. Scouting the Arena District: Scout and secure the Arena District rally point. 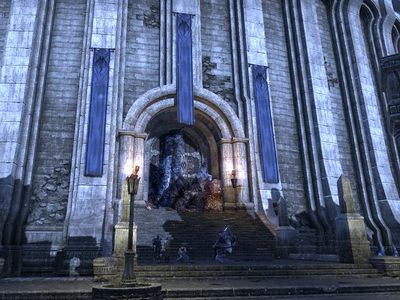 Each Alliance has a rally point in the district situated within a small tower, which can be accessed from their Alliance Base in the Imperial Sewers. The rally points are protected areas which members of enemy alliances cannot access, but enemy players can still attack players at the rally point from below with ranged weapons and spells. There is a Sanctuary area in the interior section of the rally point tower which nullifies all damage while a player is standing in it. The Arena District capture point is located on the bridge to the inaccessible Imperial Palace, in the southwest of the district. The Arena Sewer Entrance is located on the eastern side of the district, along the outer wall. It provides access to the Harena Hypogeum section of the Imperial Sewers.